In a large bowl or stand mixer, beat together the powdered sugar, butter, milk, and vanilla until a light, whippy frosting forms. Add milk a teaspoon at a time if frosting whips up too thick. It should be spreadable and firm, but light and not overly thick. Cut the outer, golden-brown edges from both of the cooled cakes. Discard edges. Crumble the center part into a large bowl. Add 2 to 3 tablespoons of frosting, mixing it into the cake crumbs with a fork until the texture resembles Playdough. Add more frosting if needed. Roll dough into 24 mini egg shapes. Set aside. Mix the remaining box of cake mix with the remaining eggs, water, and oil. Get 15 quart-sized plastic food storage bags. Fill 5 with even amounts of the batter, 5 with even amounts of frosting (reserving 1 cup of frosting in a small bowl – this frosting will stay white), and 5 with even amounts of coconut. Use the Betty Crocker™ gel food colorings to tint one bag of frosting, coconut, and batter pink. (Use about 1/2 to 1 teaspoon food coloring for the frosting and batter, and 1/4 teaspoon for the coconut.) Do the same with orange, yellow, green, blue. Knead each bag to evenly distribute the color. Fill 24 cupcake tins with cupcake wrappers. Snip the corner off of the pink batter bag. Pipe a small amount of batter in the bottom third of the first five cupcake wrappers. Set a dough egg sideways in the center of the batter, then pipe the remaining batter on top to hide the egg inside the colored cupcake batter. Repeat with remaining colors. Bake cupcakes in preheated oven for 17 to 20 minutes, or just until the center of each cupcake springs back when touched lightly. Cool cupcakes completely. Snip the corner from each colored frosting bag. Pipe the same colored frosting as the each cupcake around the outside of the cupcakes. Sprinkle with colored coconut to create a nest. Pipe a small amount of white frosting in the center of each cupcake to secure a Peeps candy chick to each cupcake top. For the full effect of these fun cupcakes, slice cupcakes in half to see the egg lying under the birds' nests. Enjoy! Colored decorator jimmies can be substituted for the coconut, if desired. 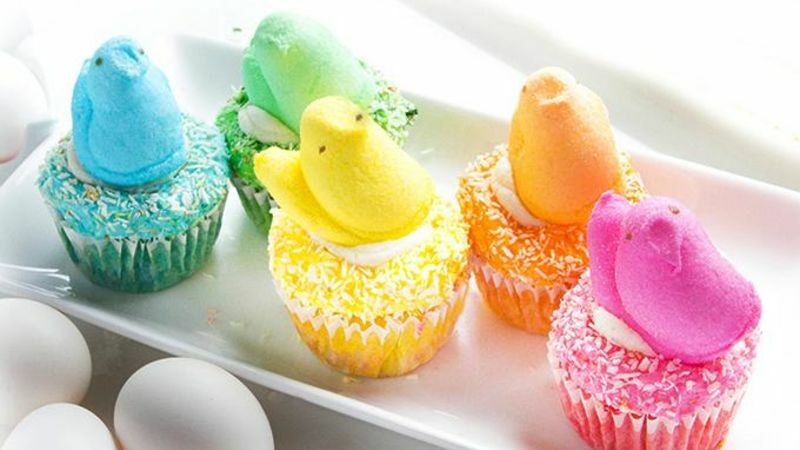 So cute, these Rainbow Peeps Reveal Cupcakes are the only centerpiece your Easter table will need! Turn your cupcakes into colorful little nests, complete with a hidden cake egg in the center. Betty Crocker cake mix makes these pretty looking Peeps-topped cupcakes easy as a spring breeze! Prep for this recipe by baking a white cake, or take a shortcut with a pre-made poundcake. Slice the outer golden edges off of the cake. This’ll keep the eggs inside your cupcakes a nice, pretty egg color, rather than yielding end results with a bit of muddled freckles (like mine). Then mix it all with some frosting to make it stick together. Once your cake mixture has turned into a Playdough-like texture, mold it into 24 little cake eggs. Separate the remaining cake batter into 5 little zip-top bags. You're going to tint it in 5 colors: Pink, orange, yellow, green and blue. Separate the coconut into another 5 bags and tint those similarly, and then do the same with the frosting. You end up with 15 bags total. Then, cover the eggs with batter to completely enclose them in your cupcakes. Bake those cupcakes in a preheated oven. Then cool them completely before frosting. To frost the cupcakes, pipe a bit of colored frosting around each cupcake. Then sprinkle them with coconut to create a nest. Pipe a bit of white frosting in the middle. This will hold your chick in place. Then, top it all with a matching Peeps chick. When the cupcakes are cut in half the cake egg is revealed!